Visit the only historic place of Alleppey which has played a significant role in the mythological history of India – Mahabharata. According to the history, this cave used to be one of the hideouts for the Pandavas during their 14 years of exile in the forest. Apart from its historical importance, the rock has also become a favourite spot for trekkers. Though the rock has lost its actual shape over the time, you can climb the other rocks beside Pandavan rock to get a nice view of the surrounding forest and Kallada dam. 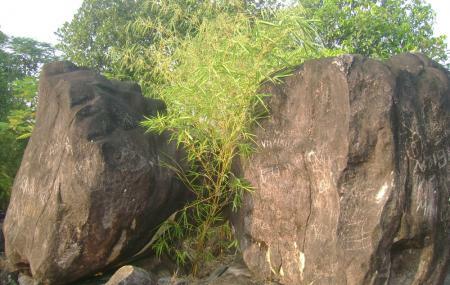 Due to its location right in the middle of the jungle, the rock has also turned one of the popular site for picnic. If you are travelling with your family, then you can definitely enjoy a picnic at this spot. You can visit the rock any time of the day. By local taxi or auto-rickshaw from Alleppey. How popular is Pandavan Rock? People normally club together Maramon Convention and Kurattikadu Pattambalam Debi Temple while planning their visit to Pandavan Rock. The Pandavan Para which is home to an ancient temple is situated at Chengannur in the Pathanamthitta district. It is located near "Noottuvar Para" named after the Kauravas depicted in the epic Mahabharata. Legend says that the Pandavas, during their exile, resided at Pandavanpara and the brothers used to offer worship at the nearby temples. The hillock has some remnants which the locals associate with the stay of Pandavas. A temple at the hilltop is dedicated to the Pandavas and has Lord Krishna as the presiding deity. There are several curious rock structures like those shaped like a frog (called 'thavalapara' in local parlance) and like the musical instrument maddalam ('maddalapara' in local parlance). Only accessible in bikes, the road leading to this place is very steep and very narrow. Gives you very good views of the surrounding places. Be sure not to go with small children as some places of the rock can be dangerous. There is a temple very close and it is recommended not to disturb the prayers. Can become very hot during the afternoon hours. Best time to go will be during sunrise.